The lawsuit argues that the constitutional rights of the families were violated by the Trump administration's policy and asks that the parents be reunited with their children, one as young as 2 years old. Three Central Americans detained after crossing the U.S.-Mexico border to seek asylum are suing the federal government over its now-reversed policy of separating them from their young children. The lawsuit, filed by lawyers with Texas RioGrande Legal Aid on Wednesday, argues the Trump administration’s policy of separating immigrant youth from their parents — which the president pulled back on Wednesday under intense national pressure — was “designed, intended and administered as a means of deterring all immigration, even legal immigration by those with a right to seek asylum.” The parents are asking the U.S. District Court for the District of Columbia to reunite them with their children and rule that the U.S. government violated their constitutional rights. The parents suing the federal government are from Guatemala and Honduras and are housed in three different immigration detention centers throughout Texas — the El Paso Processing Center, the Port Isabel Service Processing Center in Los Fresnos and the South Texas Family Residential Center near Dilley. The three parents had a total of five children separated from them after crossing the border; the kids range in age from 2 to 13. It’s unclear whether or how the children will be united with their parents in light of Trump's Wednesday announcement. Early in the afternoon, the president signed an executive order reversing procedures that have sent more than 2,000 immigrant children to facilities separate from their parents. His “zero tolerance” immigration policy — which asserts that all adult immigrants caught crossing the border will be prosecuted — will remain in place, and it's still unclear how families will be kept intact without sending kids to jail alongside their parents. The U.S. Department of Justice declined a request to comment on this story. U.S. officials previously determined that one of the families in the lawsuit — a Guatemalan mother with three children, including a 2-year-old — had a credible fear of returning to their home country. Though the family sought asylum at a port of entry — the way the system is designed to work — the children were sent to New York while the mother stayed detained in Texas, according to the lawsuit. The mother has not seen her children for more than a month. While she is occasionally allowed to talk to them on the phone, she has only heard her 2-year-old’s voice through cries, the lawsuit states. The other two parents in the lawsuit do not know where their children are, how to contact them or how they will be reunited. One of those parents, a Honduran man, was separated from his 12-year-old daughter after crossing the southern Texas border in Cameron County earlier this month, according to the complaint. He approached officials and said he was seeking asylum and had left Honduras after being shot in the shoulder and receiving death threats. Shortly after arriving at the processing center in Brownsville, his daughter was taken to another room, and he was later informed they would be separated indefinitely, according to the complaint. Another Guatemalan woman who’d been threatened in her home country had her 9-year-old son taken away from her after crossing the border near Presidio and approaching immigration officials at a nearby port of entry, the lawsuit states. The two were separated the next day, without being told why. Those two parents were criminally convicted for entering the country illegally — i.e. not at the port of entry. They're the type of border-crossers targeted by the Trump administration’s “zero tolerance” policy, and they continue to be detained as they pursue asylum claims. The Guatemalan mother of three who sought asylum at the port of entry should not have been separated from her children under the policy, according to Department of Homeland Security rules. Families that bring asylum claims legally at ports of entry can only separated if officials believe they aren't actually related, if they worry the children are unsafe with the parents or if the adult is referred for criminal prosecution. It’s unclear if any of those conditions applied in this case. 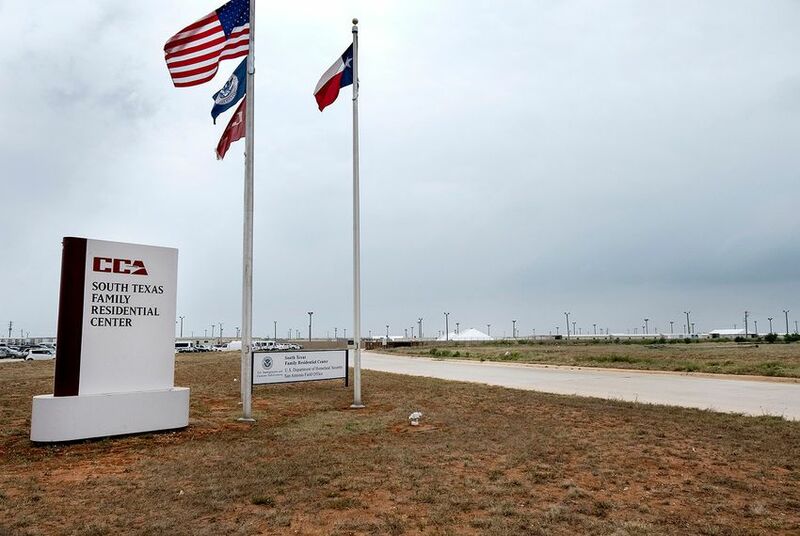 When the mother's children were sent to a facility in New York, immigration officials told her she would be detained in Texas because a judge needed to talk to her. She was told they would only be apart for a week at most. That was a month ago. The woman said she has yet to be seen by a judge.